Comments: Comments Off on Blog Articles Coming Soon! 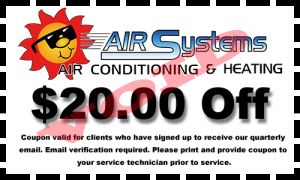 Air Systems services all of Galveston County and most of Harris and Brazoria Counties. *Offer Valid Only With Blog Subscription Sign Up Below For Eligibility. One time use only! © 2019 | Air Systems Texas. All Rights Reserved. Powered by Adwebvertising.